Edwards Signaling® Multi-Status Indicators Are Used For Applications Where Multiple Color Visual Signaling Is Desirable. 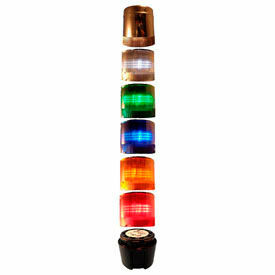 Edwards Signaling® Multi-Status Indicators are solidly made for long lasting durability and dependability. Weatherproof, optically designed fresnel lens. Immune to shock and vibration. LED light unit delivers Red, Green and Amber or Red, Blue and Amber signal. Base is manufactured from glass-reinforced thermoplastic polyester resin. Double fresnel lens is made of shatter resistant polycarbonate. XTRA-SAFE™ Technology enables status indication for those who are color blind. Type 4X enclosure can be panel or conduit mounted. Flexible multi-status dip switch settings instantly adapt for use with or without control from an external PLC, PAC or control relay. Available in 120V AC, 24V DC and 120V AC 50/60 Hz voltage options. UL and cLU listed. LED Complete Light Stacks Provide High-Visibility Multi-Status Of Industrial Machines In One Visual Signal. LED Complete Light Stacks are solidly built for long lasting durability and reliable performance. Polycarbonate housing resists shock and vibration. 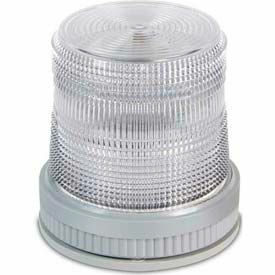 Bright LED light offers 5000 lamp life hours for low maintenance and cost savings. Two-Function light stacks can be configured to flash or shine continuously. Three-Function light stacks can be set with flashing, continuous or rotating patterns. Color options are Red-Amber, Green-Red, Green-Amber-Red, Green-Blue-Amber-Red or White-Green-Blue-Amber-Red. Dimensions and voltage vary per model.